Dave Ewert isn’t the first to say that the recovery of Michigan’s Kirtland’s warblers has been phenomenal or that 2011 was a record year for the endangered bird. That’s when state and federal biologists, researchers and volunteers observed 1,805 singing males, up from 1,747 in 2010. Both counts are well above the state’s recovery goal of 1,000 breeding pairs and light-years beyond historic lows in 1974 and 1987, when 167 singing males were found. But when Ewert, the senior conservation scientist for the Nature Conservancy in Michigan, speaks at the annual Tawas Point Birding Festival, set for May 17-20, he will talk about an aspect of the warbler’s recovery that few get to hear — the Bahamas connection. On that he is an expert, having studied the warbler’s wintering behavior on the islands for nearly a decade. The Bahamas connection is an important one: The warblers winter there. If their island habitat or food supply disappears, the diminutive birds will not thrive. Conservation scientists say it is not enough to provide habitat and manage for them on their summer nesting grounds in Michigan. Ewert’s research has shown the warblers favor island sites that have been bulldozed or burned, where they find dense shrub communities such as black porch, a small shrub with purple-black berries or, in the fall, snowberry and, later on, wild sage. Through grants and relationships with the Bahamian government, Ewert and his colleagues from the U.S. Forest Service, the Institute of Tropical Forestry and the Bahamas National Trust are working to establish better warbler conservation practices on the islands. “Working through the Bahamas National Trust staff has given us a way to talk to the Bahamas Electricity Corp. about maintaining their right-of-ways with goat browsing to maintain the early succession plants there,” Ewert said. Banding research in the Bahamas demonstrated that at least one warbler made the roughly 1,400-mile flight home to central Michigan in 13 days. Work by the Smithsonian Institution, he said, will involve attaching small geolocators to migrating warblers to plot where they travel and stop, which will help scientists better understand where the birds congregate along their migration routes. “If the data show a pattern, it will help us prioritize what areas are most important on their routes,” Ewert said. And conservation efforts may follow. 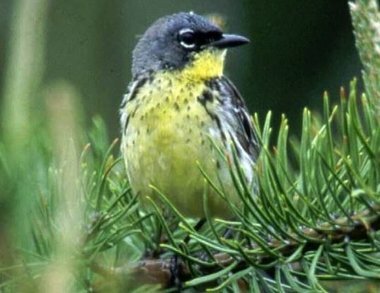 “The Tawas festival is picking up some of the activities from the Kirtland’s Warbler Festival, which isn’t happening,” said Wendy Tatar, program coordinator for Michigan Audubon. Other events at the Tawas festival include guided birding hikes and tours, bird photography workshops and a tour of Kirtland’s warbler habitat. Details can be found at tawasbirdfest.com. The Tawas festival is only one of several birding festivals this year. Some focus on particular species. Others provide a wide range of bird observations. May: Keweenaw Migratory Bird Festival in Copper Harbor. Several events spread over May weekends. See keweenawimbd.org. May 3-21: Festival of Birds 2012, Pointe Pelee National Park, Leamington Ontario, near Windsor. See festivalofbirds.ca. May 17-20: Tawas Point Birding Festival. See tawasbirdfest.com. May 30-June 3: Leelanau Peninsula BirdFest, billed as Piping Plover Country. See mibirdfest.com. June 1-3: Cerulean Warbler Weekend, Barry County. Hosted by Michigan Audubon at its Otis Sanctuary. See ceruleanwarbler.org. Aug.18: Birds, Blooms and Butterflies Festival at Dalhem Center, Jackson. See dalhemcenter.org. Sept.15-16: Lake Erie Metropark Hawkfest: Call 734-379-5020. Oct. 13-14: Crane Fest, hosted by Michigan Audubon in Calhoun County. See cranefest.org. This entry was posted in Uncategorized and tagged Bahamas, Birding Festivals, Birds, Birdwatching, Dave Ewert, Kirtland's warbler, Wildlife. Bookmark the permalink.